Здесь представлена один из разделов шестой главы каталога, сопровождавшего выставку работ художника эпохи Возрождения Фра Анжелико (15 век) в Музее искусств Метрополитен в Нью-Йорке в 2005 году. Каталог составлен кураторами этой выставки Лоуренсом Кантером и Пиа Палладино. Although little discussed in the literature on Fra Angelico, the Bern Virgin and Child is one of the artist's most beautiful and moving late creations. The intimacy of the image is accentuated by the absence of any hieratic gestures of blessing or suggestions of benedictional function: the Child is shown lifting his head and left hand to disengage himself from his mother's embrace. He turns slowly toward the spectator, of whose presence he seems to have just been made aware, while his mother's attention is still entirely focused on her son. The viewer's sense of privileged access to this very private scene is further emphasized by the painting's format and scale: the Virgin's torso fills the full width of the picture field, the arc of her halo tangent to the top molding of the (now missing) engaged frame, while the Child's left foot stretches down to the bottom molding. The restricted, strongly contrasting palette of blue and red, the warm raking light falling across the image from the left, and the highly plastic modeling of the forms complete the impact of this deceptively simple composition. 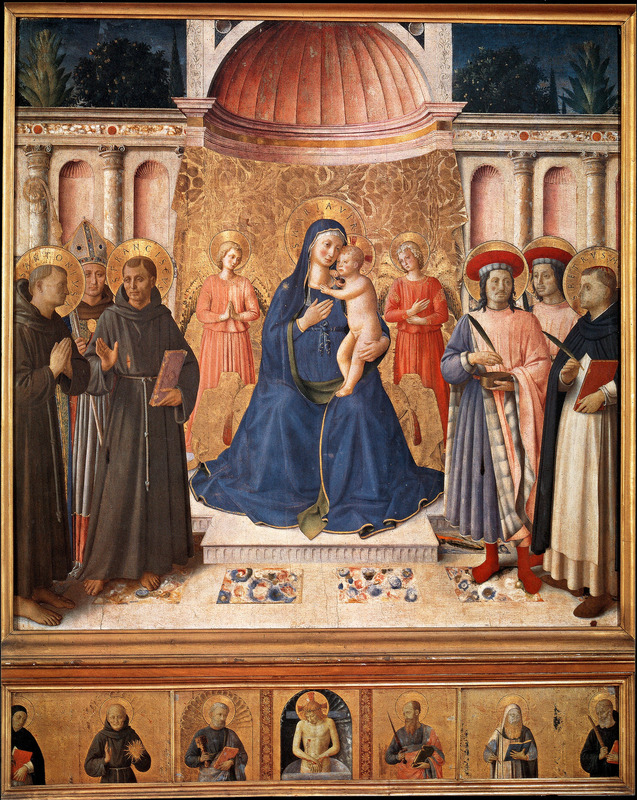 John Spike, on the other hand, conceded the possibility of an attribution to Angelico of the Bern Virgin and Child, which he knew from a photograph only, and proposed a date for the painting close to 1432, roughly contemporary with the Deposition altarpiece from Santa Trinita, now in the Museo di San Marco. (*3) Gaudenz Freuler correctly noted that the sophistication of the painting's composition alone would justify its direct ascription to Fra Angelico as an autograph work, and further observed that the color and the quality of its light effects indicate that it dates from late in the artist's career. For Freuler this date was likely to be about 1450, based on the assumption that the Guidalotti altarpiece in Perugia (cat. 30) was completed only a few years earlier and that the Bern Virgin and Child represented an advancement beyond the accomplishments of that majestic work. (*4) The Guidalotti altarpiece, however, probably dates to 1437, rather than to the last half of the 1440s; therefore, the date of the Bern panel remains a matter of discussion. 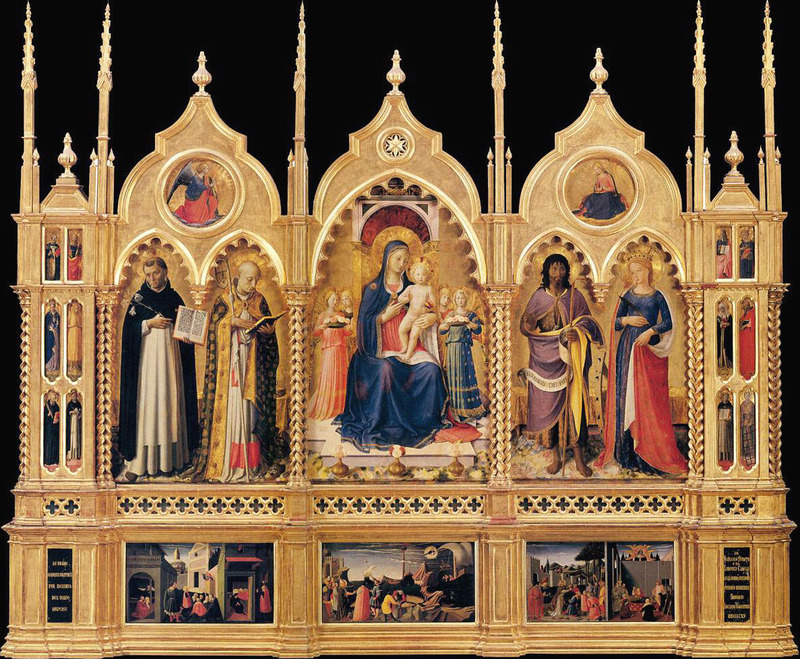 The closest point of reference for the figure types in the Bern picture and for their emotional presence is to be found in the main panel of the San Marco high altarpiece (cat. 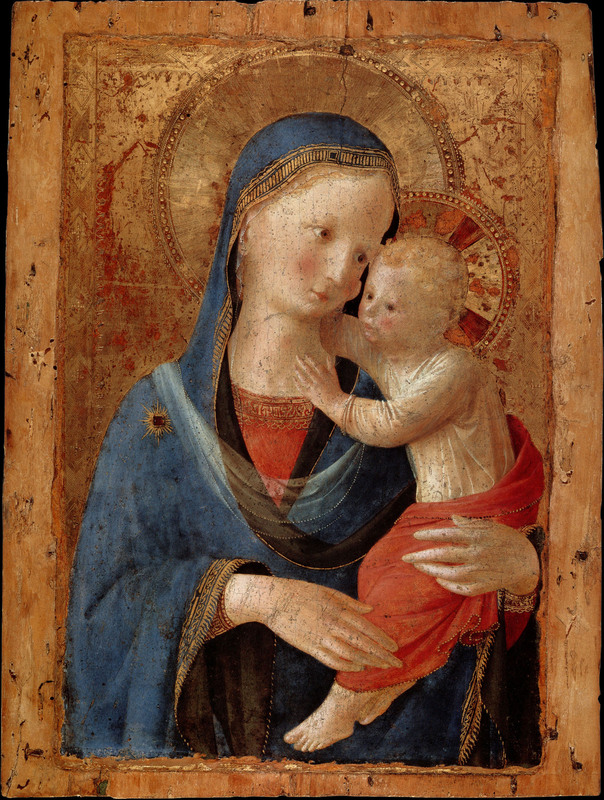 34), probably executed between 1440 and 1442, but the formality and reserve of the Virgin's posture and the Child's gesture in that altarpiece are completely at odds with the intimacy and spontaneity of the Bern painting. Петром Мучеником, Косьмой и Дамианом (Высокий Алтарь Сан Марко). This difference is probably less a matter of chronology than of function, and may be explained by the liturgical demands required of an altarpiece in contrast to the private, devotional purpose served by the smaller panel. 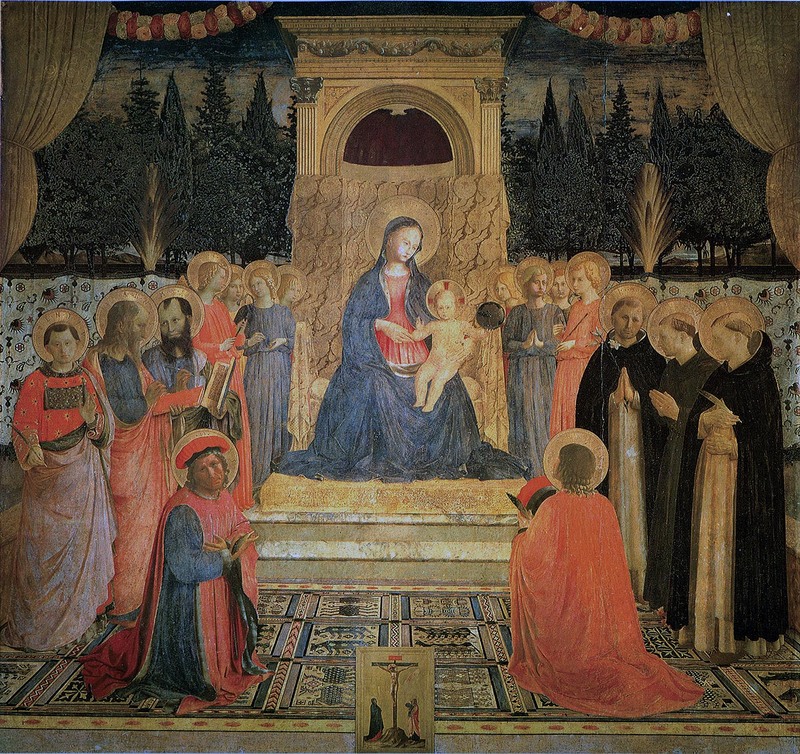 The central group of the Virgin and Child in the Bosco ai Frati altarpiece at San Marco (fig. 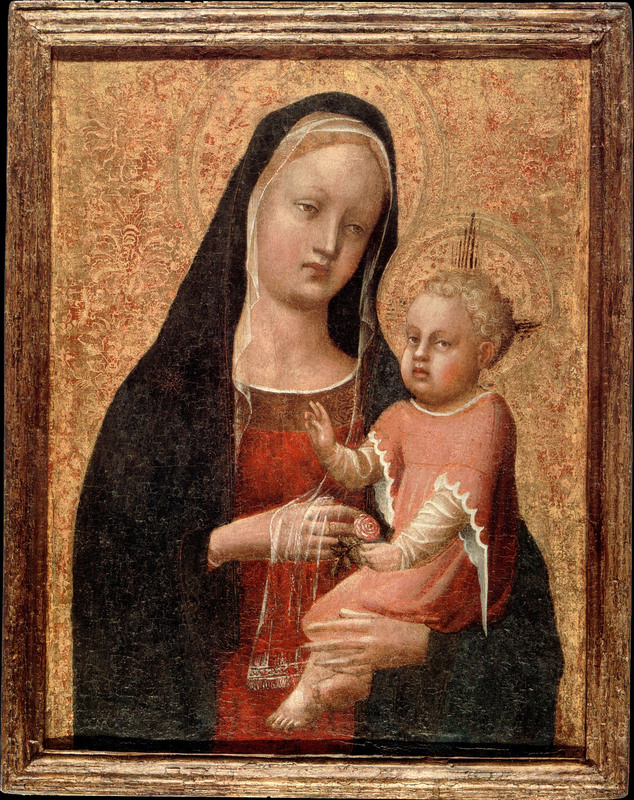 78), generally (and reasonably) dated between 1449 and 1452, follows the composition of the Bern painting more closely, but it, too, displays concessions to its liturgical context: the Virgin's gaze directly engages the spectator and the Christ Child holds a pomegranate, a symbol of the Resurrection, in his right hand. Although the compositions of the Bern and Bosco ai Frati paintings may seem, at first glance, similar enough to suggest their contemporaneity, the altarpiece reflects, in its measured disengagement and brooding, monumental calm, the final development of Angelico's figure style as first expressed on the walls of the Cappella Niccolina at the Vatican, and refined in the best of the scenes painted on the Annunziata Silver Chest. The Bern panel, by contrast, is still redolent of the emotional urgency that climaxed in Angelico's work on the predella of the San Marco high altarpiece. 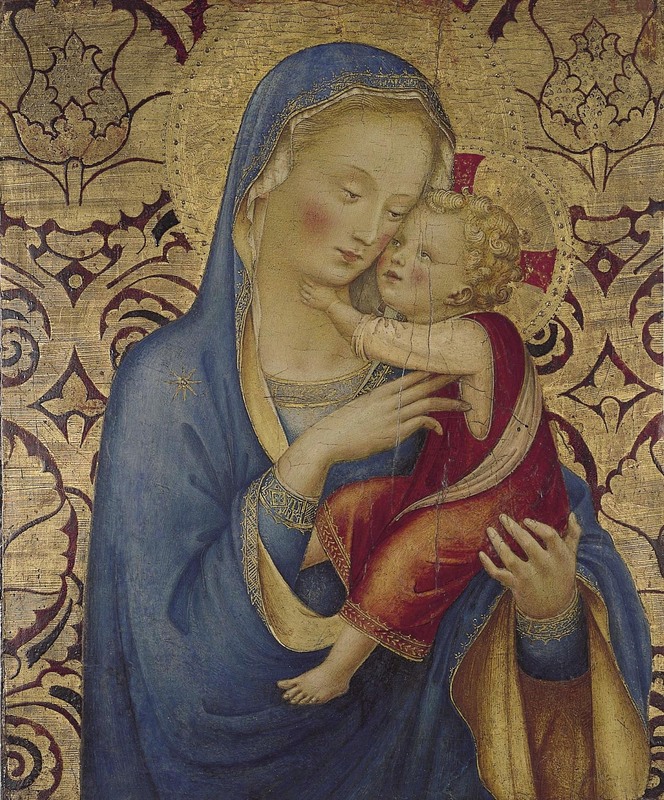 On balance, it seems preferable to date the Bern Virgin and Child just prior to Angelico's departure from Florence for Rome in 1445, rather than shortly following his return in 1448, although works from this period are so scarce that precise judgments in this regard must remain tentative. (*1). Berenson 1963, vol. I, p. II; Pope-Hennessy 1974, p. 221; Baldini 1970, p. 116, no. 119. (*2).Cole 1977, vol. II, pp. 487-88. (*3). Spike 1996, p. 258. (*4). G. Freuler, in Fehlmann and Freuler 2001, pp. 124-29. G. Bonsanti (1998, pp. 138-39) also accepts the autograph status of the painting and its relation to the Guidalotti altarpiece, but dates it on that basis to about 1437.